A professional actor, writer and comedian. He has a native Highland Scottish accent and his vocal quality is warm, rich and deep. He is a versatile voice actor with a good ear for accents. 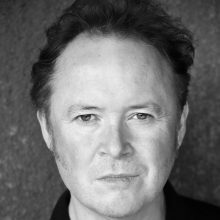 Credits include “Peeping at Bosch” for National Theatre of Scotland, Frank Cottrell Boyce’s”Return of Colmcille” for Walk the Plank/Derry City of Culture and the lead role in the Bafta-winning short film “The State of Greenock”. He has also worked with BBC Scotland, Cumbernauld Theatre, The Arches and Mischief-la-Bas.